Now the clocks have gone back, even here in Spain the nights are drawing in. Dark evenings with a chill in the air make me think back to the best of family times. All of us sitting around the dining table, chatting and enjoying each other’s company, while feasting on proper ‘comfort food’. Thick soups and broths made with the freshest seasonal vegetables, straight from the garden. Creamy casseroles. Homecooked stew and dumplings. Meals that only your mum can make. My favourite was always the pies. 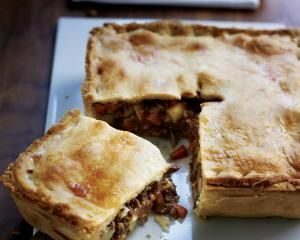 A tasty filling of slow cooked meat, encased in a crumbly pastry. Steak and Kidney. Chicken and mushroom. Beef and Ale. My mouth is watering just thinking about them. As a tribute to everyone’s mother’s home cooking – the incredible food we all grew up with – this autumn and winter we’ll be serving homecooked pies, made with the finest ingredients. In this blog, I’m going to let you in on a couple of my secrets for making the perfect pie. That it’s a pie! Forget this new-fangled idea of serving a stew with a pastry top (usually bought in pre-made). A proper pie is like a warm, comfortable home. It’s got to have a roof, walls, and a base. Inside you should find a filling that makes you feel wanted, and never want to leave. You will never find a casserole imitating a pie at Christopher’s. When we make a pie, we make a pie. Ah! The pastry. What’s the secret to a great pastry? Love, the best ingredients, and time. Always take your time. A winning piecrust pastry should take about 20 to 30 minutes to make. I prefer to use sea salt when making pastry, and half butter and half lard. And to get that crisp but crumbly texture that helps make a pie so memorable, always use half the fat to the amount of flour. Crumble the pie mix with your fingers. 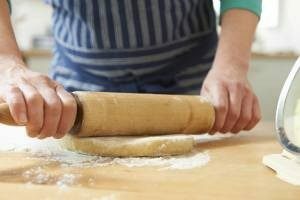 When the pastry is ready to roll and shape, do what the French call fraisage – push down on the dough with the palm of your hand. Show the pastry love from the very beginning, and when your pie is cooking the pastry will love you right back. Mastering the pastry is a challenge, especially in the Spanish climate here on the Orihuela Costa. But it’s not the biggest challenge we face when piemaking. That is the meat. If your meat isn’t up to the job, your pie will nosedive. The meat inside should melt in the mouth. Your knife should slide through each piece. There’s only one way to make sure your chosen meat is good enough to be encased in your perfect piecrust – and that’s to use the best cut of meat you can from the best supplier. You can’t use offcuts. Choose your meat because you want to make a pie – don’t make a pie because you have the meat to do so. What’s the perfect accompaniment to the perfect pie? Here’s where things get a little controversial. A creamy mash is considered by many to be the perfect accompaniment to any meat pie. But others prefer our crispy homecooked chips. Of course, a meaty gravy is a must. Unless, of course, you prefer my favourite way to eat a great pie: with chips and brown sauce. Here’s a tip for potatoes here in Spain: buy Agria potatoes. They are fantastic for all styles of potato dishes, including dauphinoise, mash, and chips. Throughout this autumn and winter, we’ll be sourcing the best ingredients (as we always do) and creating homecooked pies like your mother used to make. Crisp, crumbly pastry. Succulent, melt in the mouth meat. Homemade gravy. Served with fresh seasonal vegetables, and your choice of potatoes. What pies can you delight in at Christopher’s? The pies we create depend upon the quality of meat we can source from our suppliers. One week it may be a sumptuous steak and ale, another a luxurious venison, or perhaps an extravagant game pie. Ask us when you book. Join us for lunch or dinner. Eat a la carte or from our special set, and varied, menus. The choice is yours. Call us on (+34) 600 01 28 24 to book your table and enjoy fine dining at one of Torrevieja's top 10 restaurants (as rated by diners on www.tripadvisor.com). Our mission is to fill your table with the exceptional food and exquisite wines that help your guests provide the smiles and laughter.